Although Holt first began working with families and children affected by HIV/AIDS in China in 2005, it was just three years ago that we found a way to help orphaned and abandoned children who are living with HIV themselves. And now, for the first time, children from the HIV group homes we support in China are able to join permanent, loving families through international adoption to the U.S.
Brady (RK# 29304) had to fend for himself before coming to live at a Holt-supported group home for children who have HIV. Today, he has a sponsor and Holt is actively seeking a family for him. He was 6 years old. And he lived alone. He had a small garden, some pots to cook with, and a dog — “Old Black.” His mother and father had both passed away, and his only living relative, an 84-year-old grandmother, was afraid to take him in. He was not welcome at school. He was not welcome anywhere. He had HIV. When a local news story broke about 6-year-old Brady* growing up alone, some people left food and clothing on his doorstep. But others are less compassionate when they discover that someone with HIV is living in their midst. According to one BBC news story from 2014, the members of one village in China reportedly signed a petition to isolate and remove a young HIV-positive boy from their community. “I ask people to think about the 1980s in the U.S.,” Jian says, comparing the current HIV/AIDS crisis in China to a time in the U.S. when the disease was still not well understood, and a positive diagnosis came down like a death sentence. But the HIV virus itself is nothing new to mainland China, first emerging in the early 1990s. Over the past decade, the Chinese government has launched public awareness and prevention campaigns across the country — significantly reducing the spread of the disease. Progress has lagged, however, in two critical areas — reducing mother-to-child transmission, and addressing misconceptions that perpetuate the stigma against people living with HIV. Despite policies put in place to protect people living with HIV in China, lack of understanding about the disease continues to make life extremely difficult for this vulnerable population. Contrary to what many in China believe, HIV is not isolated to an underworld of drugs and prostitution. Many were born with this stigmatizing disease. They are just children. Holt first began working with families and children affected by HIV/AIDS in China in 2005 in the central province of Shanxi, where a large number of people had contracted the disease through blood transfusions. With few antiretroviral drugs available at the time, many people in this impoverished community died of AIDS — leaving their children in the care of relatives, often elderly grandparents. By partnering with child sponsors in the U.S., Holt was able to provide educational support for the children and stabilizing resources for their families. But it wasn’t until three years ago that Holt found a way to help orphaned and abandoned children who are living with HIV themselves — children who not only lost their parents to the disease, but lost their entire families, homes and communities due to pervasive and unfounded fear. For the first time, Holt would be able to serve these hard-to-reach children. “We learned about a local orphanage that would send children to these HIV group homes,” Jian explains. Started 10 years ago by an overseas Chinese organization called AIDS Care China, the group homes emerged in response to a need the organization recognized when they first expanded to mainland China to provide treatment services in HIV-affected communities. When parents died of AIDS in these communities, family members would bring their orphaned children to the staff of AIDS Care China. But at the time, the organization did not offer any sort of residential care. Recognizing that local orphanages were either unwilling or ill equipped to meet the needs of HIV-positive children, the staff decided to create a new model of care ­— a model in which children with HIV would receive safe and nurturing care in a home-like environment. When Jian first visited one of the group homes in southwestern China, she was moved by the compassion shown by the staff and caregivers. She also saw that they needed help. With nearly 30 children in care, ages 2-17, the group home struggled to meet the needs of each child. Although the government covers the cost of antiretroviral drugs, their insurance does not cover their overall medical care — a considerable expense for children with HIV, who tend to get sick more often and are more vulnerable to illnesses like pneumonia. Enrolling the children in public school was also not an option. If their diagnosis was discovered, they would not only be turned away at the school door — they also risked the group home’s landlord finding out. Already, the children and their caregivers had been evicted several times and forced to move to a new location where no one knew their health status. To avoid exposure, the children attended private school — a tremendous expense that stretched the group home’s resources to next to nothing. 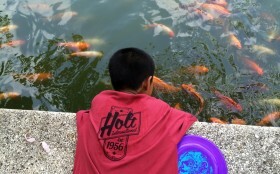 Fortunately, Holt already had a model in place to meet the everyday needs of orphaned and vulnerable children. Partnering first with one group home, Holt went to work finding sponsors to help meet each child’s daily living expenses, and began seeking donors to meet additional needs like training for social workers to counsel the children. Through the group home, the children have regained some of what they’ve lost. They have some semblance of family life with their caregivers and other children. They can go to school. They have a loving home environment. But their future is uncertain if they come of age in China, where they will almost certainly experience discrimination when seeking work or higher education. So far — and with great support of the CCCWA, the central adoption authority in China— Holt has matched six children from one HIV group home, and continues to seek families for two more children. Once their paperwork is complete, more children will become eligible for international adoption to the U.S.
Jian hopes that one day, HIV will no longer carry the stigma it does in China. “How can you educate a province with more than 20 million people? People just don’t know,” says Jian, who now hopes to work alongside leaders in China to help pass a bill to bolster HIV awareness. With greater education and understanding, she believes the fear will abate — and children who are HIV-positive will be able to grow up in the loving care of their birth families, in the country and culture to which they were born. Here, in a province heavily affected by the drug trade, hundreds of thousands of children have tested positive for HIV. On a recent trip, Jian met with the directors at a brand new orphanage who shared the challenges they face. Although able to accommodate 350 children, only 35-40 children are currently in care at the orphanage — none of whom are HIV-positive despite the tremendous need in the community. “They are afraid to take in kids with HIV because they don’t know how to care for them,” Jian says. Although well equipped and well intentioned, the staff and caregivers at the orphanage lack the training to meet the unique needs of these children. Jian hopes to work with AIDS Care China to replicate the group home model in this province — and ultimately, to begin seeking permanent families for them through adoption. One child who has grown significantly during his time in an HIV group home is Brady, who is now 11 years old. A Holt ambassador who recently spent time getting to know Brady describes him as a “brilliant, caring and independent young man” who is an exceptional athlete and a loving and loyal friend. Brady no longer lives alone with his dog. He no longer cooks his own meals or washes his own clothes. He is now in school, has compassionate sponsors in the U.S. who help meet his needs, and is surrounded by people who love and care for him. Hopefully one day soon, he will also have a loving family to call his own.